Is it your dream to be coached by the best thinkers working at the most innovative social media companies in San Francisco? 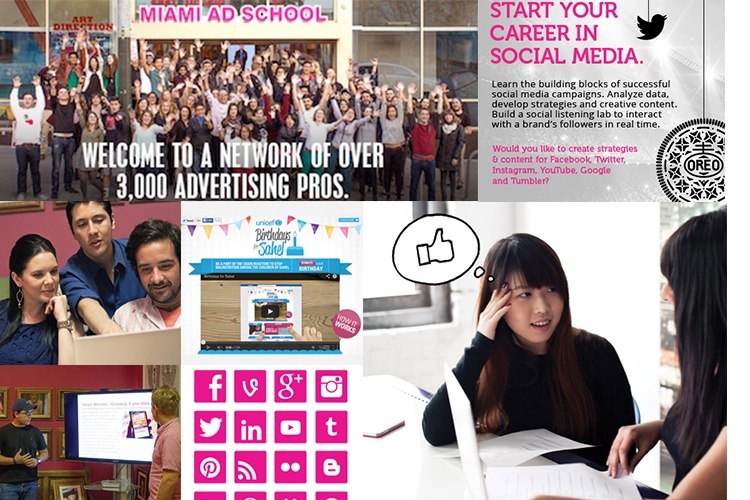 Now you no longer have to imagine it… Miami Ad School’s social media boot camp is coming to San Francisco! San Francisco is the epicenter of the new tech and media scene. Google Yahoo, Pineterest, LinkedIn, Twitter, Yelp, Uber, Airbnb, Stubhub, Splunk, Dropbox, Square, Adobe and Salesforce have made the Bay Area their home. In 12 short-but-intense weeks you’ll learn to develop social media strategies and campaigns. You’ll have the skills you need to show your future employer you can build brands and manage clients social presence using social media. Each week your mentor will be a different social media expert. Instructors include professionals from Twitter, Facebook, Google and top agencies like R/GA, MUH-TAY-ZIK HOFFER and CutWater. In each 3-day session your instructors cover a different aspect of social media. You’ll learn the different aspects of social media from content strategies, paid media and texting campaigns, to understanding data and analytics. The rest of the week, you partner with a content creation team and based on your social strategy develop a social media campaign including vines, snapchats, Facebook ads, Tweets and anything else that will create an engaged following for your brand. In the final week of the Boot Camp visit a variety of ad agencies, brands and media firms. Experience the different types of social media work environments. You’ll meet the people in the social media departments and increase your network of industry contacts. Email, call or visit the San Francisco location; experience the culture and discover why Miami Ad School is the right choice for you. Become a social media expert! Apply Now. Learn more about the Boot Camp for Social Media.